Tonight Travis came by to see what he might want out of the stash of goodies Arlene gave me. He took much of it and went away with Mai Tai and Margarita mix too. 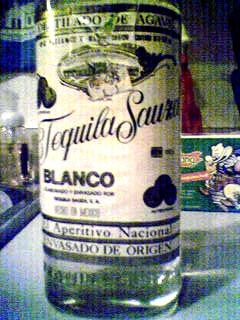 I was also going to give him this bottle of tequila that was unfamiliar to me. Then he and I noticed that there was a price tag on it. It said $62. I told him if it costs $62 for that bottle not only would I have to keep it but we would have to try some. I got a couple of sake cups for shot glasses, Travis iced-down some of the tequila and we had a shot each. Pretty smooth stuff. To think I almost gave this away.